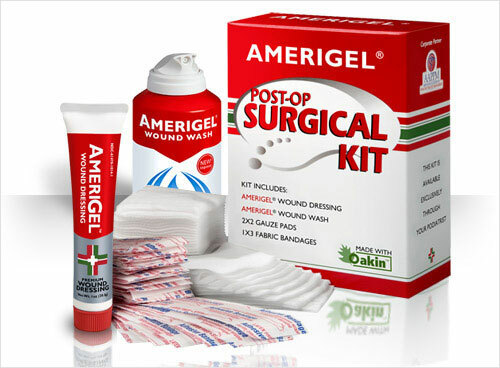 AmeriGel® Post-op Surgical Kit combines the advantages of Amerigel® wound care products with the convenience of a 30-day, pre-packed, easy to use kit. Developed for use following minor surgical procedures including I & D, nail surgery, wound debridement, wart removal, skin biopsy and laser surgery, AmeriGel® Post-op Surgical Kit contains everything necessary to meet the needs of your patients post-op care protocol. Increase patient compliance and outcomes while saving patients time and money by dispensing the AmeriGel® Post-op Kit from your practice. Your patients will appreciate the convenience of leaving your practice with the appropriate post-op dressings and avoiding costly and confusing trips to the pharmacy.